This is the most complete DONE4YOU service we have ever offered and its the easiest and simplest way for you to get started on your lead generating, list building, sales generating business. We have been building lists and helping marketers online for more than 15 years. Now you can benefit from our expertise and marketing power. We will create a stunning capture page for you at Onyalist and create a persuasive message that compels people to signup . (value $125.00). We will setup a 3 page sales funnel to give you a shot at making some sales while we build your list for you. This means you can promote up to 3 offers of your own choosing which are attached to the one capture page we will create for you. (value $100.00). 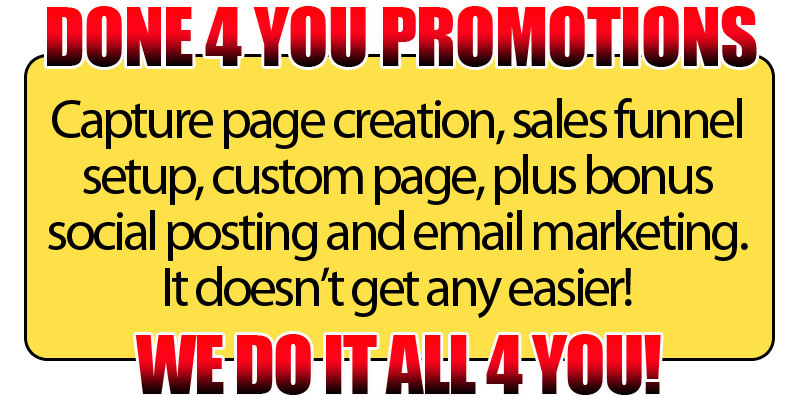 We will create a custom page for you (part of the sales funnel) so you can promote anything you like. You can give away a free gift on it, invite people to subscribe to a course, or to signup for a webinar. It's your page and we will customize it for you. (value $295.00). We will connect your capture page to your favorite autoresponder so you can collect leads two ways both at Onyalist and in your autoresponder. If you do not have an autoresponder, you can use the onyalist mailer to contact your leads. Your leads will appear in your Onyalist back office. You will also get an unlimited account at Onyalist so you can create even more capture pages, collect even more leads and make even more sales. (value $114.00). Next you will get 2 awesome bonuses. BONUS 1 - We will take your capture page, create a short post for you and post it to our top social media sites with large followings including Facebook, Twitter, LinkedIn and Sokule. We will email your offer to over 55,000 Sokule and Yakamore members. We will generate a unique link for you to use in all future promotions. By the time we are done your message will be all over the net. (value $497.00). BONUS 2 - We will create a compelling ad for your capture page and email it to 50,000 of our private active list members (value $497.00). We will provide you with the ad so you can use it in your own future promotions. You get a top level account with login and stats. This price is for NON Onyalist Members Only. You will get an unlimited account at Onyalist with this package. This package is offered on a strict first to order, first served basis. We are only accepting the first 10 orders because each of these campaigns takes time to setup and complete. Note: You must be an existing Onyalist unlimited account holder to purchase this package. If you are not an Onyalist member yet please choose the top package for $497.00 - An Onyalist unlimited account is included in this price. click here to join Onyalist without purchasing one of the packages above - Discover why Onylist is one of the top ways to make money on the internet. Important: You are paying for Capture page and Custom page creation and copywriting. Once these are completed and approved by you there are no refunds available. Copyright 2015-2016 - JAM Marketing - All rights reserved worldwide.